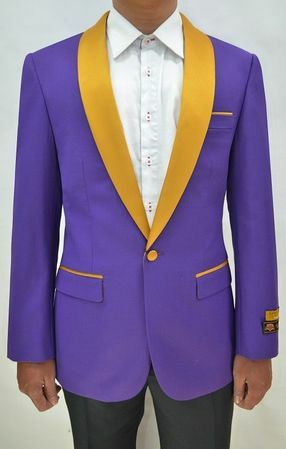 If you want to see the attendees drop their drinks when you enter that ballroom, you need to be wearing a fancy and stylish purple and gold tuxedo jacket. by Alberto. This two tone jacket has a style that is made for it's ever eye catching presence. It comes in a modern fit style that is a more tailored fit than regular fit and has side vents. Made of Micro Fiber.